We expect dry weather in late summer so while Southland, Canterbury, Marlborough and much of the North Island were getting publicity about drought last month we were still saying it was situation normal. But as rain has fallen in most other areas it has stayed away from here, though thanks to increased irrigation we are not so badly off as we were a couple of years ago when the photo above was taken. 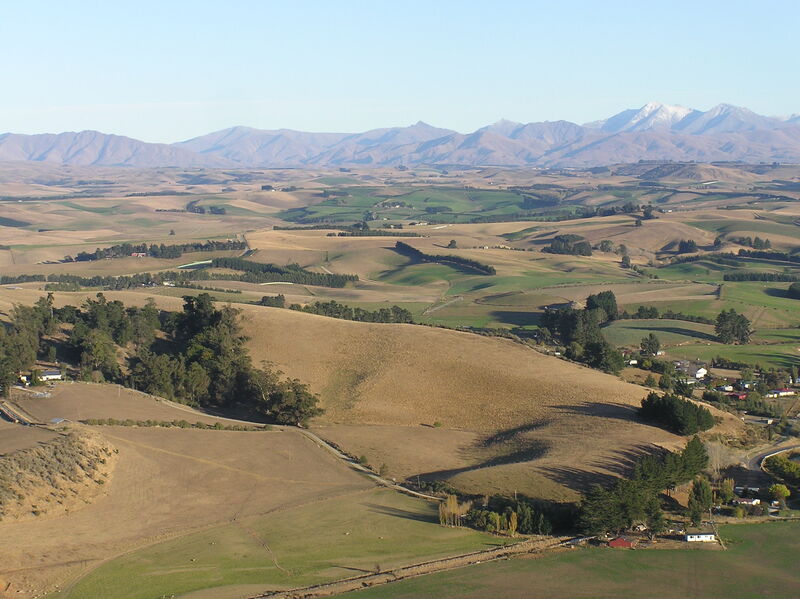 Now thanks to the North Otago irrigation scheme a lot more of the Waiareka Valley is green but those still on dryland are getting very worried. We had about 20 mls of rain today, That’s a good start, and definitely better than a nor-wester, but we need a lot more to get soil moisture levels up before it gets too cold. The Herald editorial – Strategic When It Suits – sums up Labour’s hypocrisy on asset sales. I’ve never understood the xenophobic attitude to foreign investment. When we converted to dairying we borrowed from the bank and as a result we’ve employed more staff, used more contractors, done more development, produced more, earned more and paid more tax all of which helps the local economy and New Zealand. The bank we borrowed from has foreign owners but uses a building in the main street on which it must pay rent or rates. It employs local people and their wages flow into the economy. It sponsors local and national events, including the Young Farmer of the Year contest; and it pays tax. Some of its profit is reinvested in New Zealand and yes some goes back to its overseas owners. But so what? That’s just the price we pay for being able to borrow their money. The Government’s role is to get the regulatory framework right to protect New Zealand and New Zealanders, once that’s done it shouldn’t matter who owns which companies. Anyone who still thinks removing GST from food is a good idea should read Don Brash’s column in this morning’s Herald. The usual increase in spending is more notable this year because political parties and other groups are so hamstrung by the Electoral Finance Act. We now spend 19 more days working to pay our taxes than in 2001 and if local government and other government spending were added Tax Freedom Day would be June 4. Bill Ralston writes in this week’s Listener about keeping kids safe and says: Kids do face a larger array of hazards than their parents did. But the biggest problem they face is not being armed with the fundamentals of life – a set of core values. His view is reinforced by this true story: A university student told her mother that she had been talking to her friends and they’d all concluded how lucky they were to have been brought up in families where their parents loved each other and their children; set them boundaries and made them face consequences when they breached them; modelled work ethics, taught them the value of money and the importance of values including honesty, kindness, consideration and respect for themselves and others. The mother was touched but she was also saddened because when she’d been 21 she’d have taken these things for granted because they would have been normal; obviously her daughter and her friends didn’t because they no longer are. There are many reasons for this, one of which is the intrusion of the state into people’s lives. Of course there must be some rules and safeguards, but those who try to make the world really safe, not just for children but for all of us, actually make it more dangerous because we stop taking responsibility for ourselves. Personal responsibility is one of the core values, like the others the students recognised, that used to be common place, but isn’t so common anymore. Bill refers to Principal Youth Court Judge, Andrew Becroft’s appeal for schools to help those kids whose families don’t teach them personal values. I am wary of putting more on to already over-loaded teachers and I also wonder how much can be taught at school if it’s not being modelled at home and in society at large. But it too seemed immovable. those closest to me, but alas, they would have none of it. I would have changed my family. who knows, I may have even changed the world. A good tax may be an oxymoron but a simple tax is better and GST is simple. But making exemptions to GST would create complications, making it more difficult and expensive to administer and operate; and it would mask the symptoms rather than solving the problem. It would be extremely difficult to justify exempting luxury food from GST, but how do you draw the line between luxury and necessity? In Australia that has led to a confusing judgements: bread and lettuce are exempt from GST but a salad sandwich isn’t; a raw chicken is GST free but the same bird would incur the tax if sold cooked. The problem of affordability of food is not GST. It is partly a result of global influences one of which is that vast areas of land which were producing food are now growing crops for bio-fuels. It is also because we are a relatively low waged, high taxed economy. Both those problems would be better addressed by lowering income taxes rather than by tinkering with GST. You are currently browsing the Homepaddock blog archives for April, 2008.